Well-behaved women seldom make history --- Laurel Thatcher Ulrich didn't lie about that some 30-odd years ago, and her statement rang with much ferocity this past Saturday when activist and all-around Renaissance woman Bree Newsome added her name to the long list of women who have caused a little mischief in the name of progress after she climbed up the flagpole outside of the South Carolina statehouse and removed its Confederate flag. In an instant she became a social media goddess, liken to social justice warriors like Fannie Lou Hammer and Wonder Woman, and immortalized in photos and artwork for her courageous and bold act that needed to have been done, well, decades ago. Long misinterpreted and largely utilized as a symbol for slavery and oppression, in the wake of the Charleston massacre controversy over the Confederate flag and its removal has emerged again. Many have voiced that the flag's symbolism represents and promotes an intolerant and archaic time, and its removal is of urgency, yet South Carolina officials, while attempting to balm heated debate promised prompt removal of the stars and bars, kept dragging their feet as the flag continued to be raised, it still whipping in the wind as Rev. Clementa Pinckney, one of the victims of the massacre at Emanuel AME Church, was wheeled to the statehouse to be laid in state on Wednesday. The sight of it was disrespectful, as it was misleading, considering multiple merchants and manufacturing companies have ceased to make or sell items that promote the vision of the flag, and other states such as Mississippi and Georgia are re-evaluating their stances on it. So what gives, government of South Carolina? Why is the flag still being flown after all these promises to remove it? Newsome didn't wait for the response as she figured that if nobody was going to be fearless enough to remove it, then she will. So in the wee morning hours of Saturday she donned mountain climbing gear and clambered up the 30ft pole, snatching the flag, and bringing it promptly down like she was a contestant on Nickelodeon's GUTS. Newsome slips into an interesting position in the #BlackLivesMatter movement, as ever since the movement's conception in 2013, a clear, prominent figure that mirrors such giants like Martin Luther King, Jr. and Malcolm X of the 1950s and 60s Civil Rights Movement has yet to come to the forefront. Often we have wanted President Obama, our first African-American president, to be that prominent town crier against racism, but we forget that he isn't the re-incarnation of MLK, nor some Sultan of Black People Land --- he's a politician, a president of a nation, with hands tied by his GOP ridden cabinet. In a lot of ways the Internet had clearly altered and re-shaped how we conduct our activism, as we don't have one person or a few 'chosen ones' that we have to rely on to speak for us. Now we all have the power to speak up and out, and have multiple cyber soapboxes to do it upon. Yet, Newsome's act of bravery is almost old school in its rendering. It's good old-fashioned demonstration, a careful mix of calculation and keen initiative and it got the point across...or did it? Along with her compatriot, James Tyson, Newsome was arrested after her climb, both charged with "defacing monuments on state Capitol grounds". They also both face a fine up to $5,000, and could be looking at a three-year prison term, according to a report from USA Today. Newsome and Tyson have since been released on bail thanks to a wealth of donations via Indiegogo, but the infamous flag Newsome removed was put back up and a rally supporting the flag was conducted moments after her protest. So what exactly changed for the better when on the outset it looks so much worse? In thinking that Newsome accomplished nothing by taking down the stars and bars, we're forgetting how activism works. Activism is never cut and dry. It's never a 'one-time event', as Audre Lorde so succinctly put it. It's sequences and cycles, where we have to do the act again and again and again and again in order for the end result to alter. Newsome and her unapologetic chutzpah proves the point that you have to take that risk, get caught up in the knotted rat's tail before you can begin to even untangle it. Change just doesn't happen when you're passive. As much as we don't want history to repeat itself, we have to hark back to it in order to figure out new ways to nurture awareness, and learn that change is often an arduous and chaotic process, but can be worth it in the end when it does occur. Just this past week we've seen how much vigorous diligence has led to significant headway with healthcare reform being upheld and gay marriage legalized in all 50 states. Newsome's brave climb was the cherry on top of a progressive sundae that continues to gain new flavors as she serves the #BlackLivesMatter's movement its boldest move yet. Her courage (and mad incredible upper body strength!) 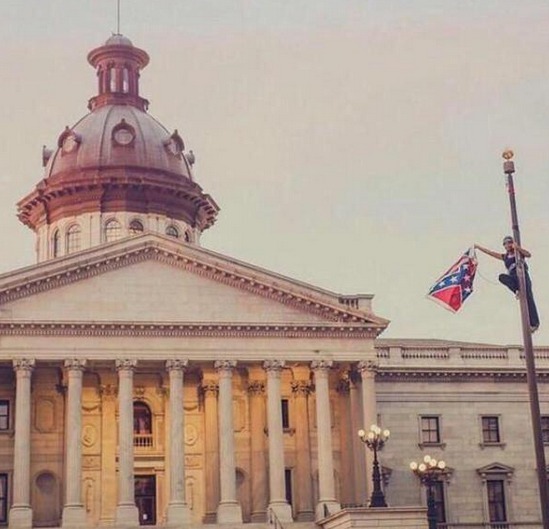 is just so got damn glorious to behold that it feels more and more like a victory than a defeat to me, and it's why Bree Newsome is a lady who most assuredly rocks.